Virginia Giddings heads the Program Management Office at Stryker Neurovascular, with responsibility to deliver innovative products to treat stroke patients. Previously at Abbott, she led Strategic R&D for the Nutrition division, with global responsibility for early-stage research and science partnerships. Also at Abbott, she played a key role in US approval of XIENCE V drug eluting stent and led the technical strategy for ABSORB, a novel bioabsorbable stent, resulting in first of kind CE Mark approval and EU launch. A patent agent, she had IP strategy roles with J&J and Advanced Stent Technologies. 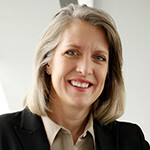 She serves on the Cornell Engineering Council, President’s Council of Cornell Women, Georgia Tech-Emory Bioengineering Board and is a Fellow of the American Institute of Medical and Biological Engineering. She is a co-founder of MedtechWomen. She received Bachelor’s and Master’s in Mechanical Engineering from Cornell University and a Ph.D. in Biomechanical Engineering from Stanford.